The Image Sensor detects motion, captures a picture of the activity, and sends it to you instantly for viewing. This small, wireless sensor is battery powered and easily attaches to a wall at home to give you visibility to what’s happening when you’re not there. Get a quick picture throughout the day to see that the kids arrived home from school or check in when you want to snap a picture. Peek in to capture and upload images immediately from anywhere using your smartphone, tablet, or computer and see what’s going on. Pictures are saved in a gallery that you can always access to see a history of your images at any time. Automate your sensor with custom rules to see only the things you care about. Set your sensor to take a picture of the first motion event after your specified time of inactivity or during certain time frames of your choice. 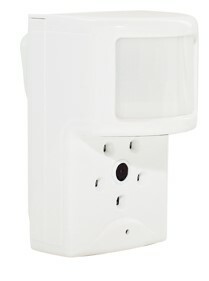 You can also use the sensor as a trigger to automate other connected devices at home – so you can have the lights turn on in a dark hallway as soon as the sensor detects motion. Get text or email alerts instantly with the images you care about – like anytime the dog walker arrives, or when a family member gets home. With sensitive motion detection the sensor monitors activity, but stays immune to motion from pets walking around so they aren’t constantly tripping the sensor. The Image Sensor is a simple and effective solution for monitoring motion at home. It captures high quality images in daytime or at night using an onboard color camera with Night Vision LED flash to ensure you’re always getting the visual verification you’re looking for.